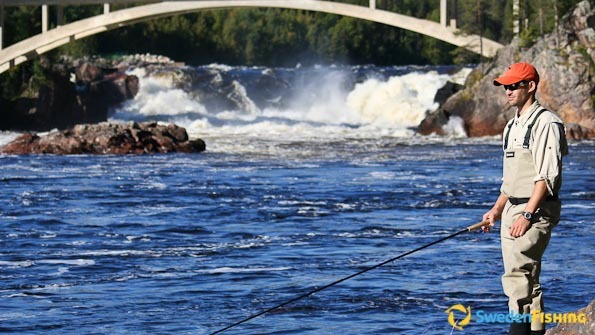 We call the Jockfall facility ‘the salmon fishers’ paradise’ – its location on to the roaring Kalixälv River is superb, especially at the unmatched 9-metre Jockfall. We offer our visitors a splendid opportunity to hook truly large salmon in a fantastic setting. Still, should you rather fish pike, there are fine lakes in the vicinity with good boats for hire. You live in authentic cabins with four beds, close to the river and with access to sauna, shower, restaurant and fishing shop. The midnight sun provides that little extra interest and lets you fish all night. We speak Swedish, English and German at the Jockfall Fishing Camp. Salmon fishing lasts from June through August as the fish migrate all summer. Fishing for pike starts as early as in May and runs through to the end of September. Moose or small game hunting at the Polar Circle with qualified dogs. Excellent conference opportunities in our new facility near the Kalixälven River. Exclusive, two-day casting and fishing course with Ronny Landin, one of this countrys best casting angler. Youll learn the basics of fly-fishing using one or two-handed rods. Salmon – 23.6 kg, spin; Pike – 17 kg, trolling in Lake Vallsjärv; Brown trout – 8 kg, spin. The largest salmon to pass the salmon ladder at Jockfall measured 149 cm. We have genuine rapids boats with 5 and 10 hp motors for salmon and trout trolling. There is even a 5.5-m, double-bottom boat with a 25 hp motor and a 6.5-m boat with a 9.9 hp, four-stroke Yamaha motor. We can arrange guides for both salmon and pike fishing, as well as offering excellent salmon and pike fishing equipment for hire. Well stocked tackle shop and restaurant in the main building. For fly-fishing we recommend 13-15 feet, two-handed rods with reels holding at least 200 metres backing line. The same is true for spin fishing, though the length is 10-12 feet with larger, open-face or multireels holding up to 200 metres line. We recommend a 0.45 to 0-60 mm line. 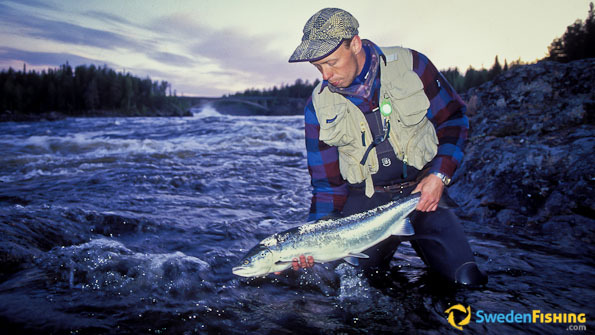 When smaller salmon appear later in the season, lighter equipment can be used. Both fly and spin fishing in Jockfall is done from the shore, moving along both sides of the river while shifting rods and changing sides daily. The recommended limit per angler is on salmon per day using the catch and release system. 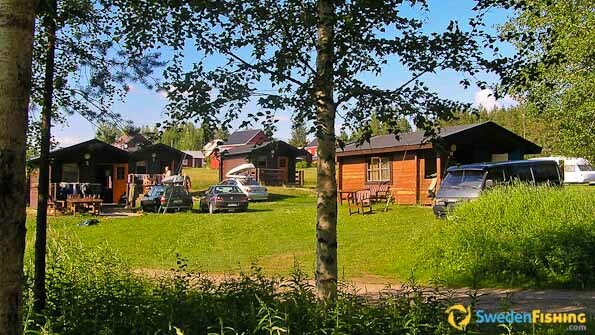 The camp lies some hundred metres from the fishing site in a lovely location on the Kalixälven River. The wilderness cabins hold four beds each and are equipped with china, refrigerator and hob. Shower, sauna and WC are in a separate service building. Each cabin has outdoor furniture. One of the cabins is fitted for handicap use with its own shower and WC. There is plenty of space at the camp for tents or caravans. The new restaurant at the waterfall building offers a large porch, conference facility and local specialities. There is also a fishing and souvenir shop. There is a 9-metre high salmon ladder along the fall to facilitate salmon migration. You can observe their progress via the on-line camera in the restaurant. Jockfall is located at the Polar Circle in northern Sweden, 40 km north of Överkalix village. The closest airport is some 2 hrs by car  150 km south in Luleå.